Red oak supplies are abundant and it remains popular for kitchen cabinetry and furniture, especially for Mission and Arts and Craft style projects. The heartwood is reddish tan to brown and generally uniform in color. Its sapwood is white to light brown, and minimal in volume. 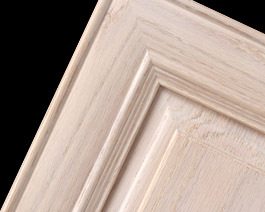 Red Oak shares a similar appearance to white oak, but with a slightly less pronounced figure due to the smaller rays. It is open grained and in its plain sawed or sliced form expresses a very strong “cathedral” type grain pattern with a coarse texture.